Humans have been hunting deer for thousands of years. But it is not just the meat that is useful. Antler is easy to carve and can be worked into a variety of tools and jewellery. If you are looking for a family friendly woodland quest, shed hunting may be answer. 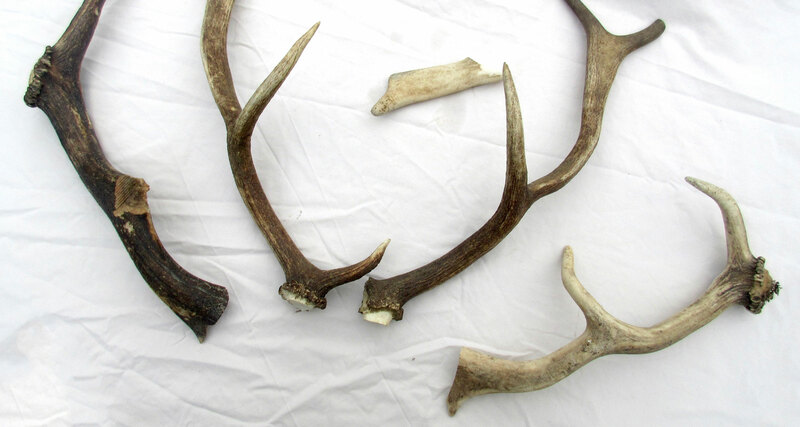 Antler hunting is popular in north America where it is called shed hunting. Unlike horns, antlers are made from bone and Red, Sika, Roe and Fallow deer grow a new set every year. With hundreds of thousands of antlered deer in the UK, there are many thousands of fresh antlers to be found in our woodlands annually should we care to look for them. Antler hunting is a great excuse to spend some time outdoors with the children. Look for crossing points and follow them. A deer 'couch' is normally found beneath trees and is used for resting and rumination. Wherever there’s woodland there will likely be deer. It’s in these areas and on woodland edges that you’re most likely to find cast antlers lying upon the ground. But be warned, it’s a challenge. Secluded south facing slopes and woodland edges are best as these places receive the most light. Being slightly warmer, they will hold deer during the winter. Deer will normally shed where they spend the most time and they’ll spend the most time where they feel well fed and secure. The winter months and the early to mid-spring are the best time to locate these areas as the deer trails are still easy to find in the absence of dense undergrowth. When following these tracks, look out for obstacles like fences and ditches that deer may need to jump as the impact can often shake the antlers loose. If you find one full, undamaged antler with its pedicle intact (the distinctive base of growth) you’ll normally find the other within a few hundred metres. Carrying a pair of decent binoculars is really useful when scanning the woodland and prevents you having to walk over to investigate each and every one. I’m currently using a pair of Hawke Endurance ED 8×42 Binoculars. Antler hunting is a great excuse to spend some time outdoors with the children. You can find antlers at any time of the year. Although they’ll be easiest to spot when first cast. Before time, algae and other creatures have had their way with them. The exact time and date of casting varies depending on the climate, the species and the individual. For Fallow, you can assume that the majority of mature males will cast between the mid- April and early May. It’s good practice to avoid exploring areas of dense woodland cover in June or July. Fallow deer will be giving birth at this time and shouldn’t be disturbed. Whenever you’re out during the year it’s important that you stick to the legally marked rights of way. Keep your questing confined to the middle of the day so as to keep safe and minimise disturbance to shooting and deer management activities. The overcast daylight hours of deep winter and early spring are best for spotting bones, particularly after rain. In these conditions, the polished tines (points) will glisten with moisture. Contrasting the dull, earth tones of the surrounding vegetation. A pair of these would be quite a find! Although you’re most likely to stumble on cast antlers unintentionally. It’s worth keeping an eye out as the rut fades (Oct-Nov) and winter approaches as this year’s castings will still be visible under the receding bracken. It’s likely that our forebears would have kept keen eye on the ground at all times of the year, perhaps we should too.